Going to the gym may not be enough to keep off the pounds if you drive to work. That’s the result of a study published recently in the American Journal of Preventive Medicine. 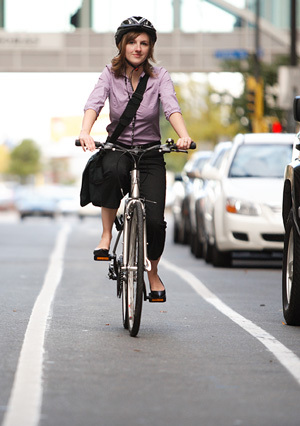 According to an Australian research team, active commuting is an effective defense against gaining weight. Among a sample of 822 Australian adults tracked over four years, people who walked or biked to work gained about two pounds less, on average, than daily car commuters. Lead researcher Takemi Sugiyama, a behavioral epidemiologist at Baker IDI Heart and Diabetes Institute in Melbourne, said it may be difficult for people who drive to work to find the extra time to devote to exercise. “In order to achieve the level of physical activity needed to prevent weight gain, it may be more realistic to accumulate physical activity through active transport, rather than adding exercise to weekly leisure-time routines,” she told the Health Behavior News Service, part of the Center for Advancing Health. The study found that engaging in “sufficient leisure-time physical activity” also helped people avoid weight gain, but that car commuters who exercised regularly in their free time still put on more pounds than active commuters. Street conditions, of course, will have to improve to make active commuting a viable option for more people in the U.S. “For most Americans, it is challenging to find a safe route to work or shopping due to factors such as traffic concerns, lack of sidewalks, or protected bike paths,” said Penny Gordon-Larsen, a public health expert at the University of North Carolina at Chapel Hill, told the Health Behavior News Service. Hat tip to Jay Walljasper at Bikes Belong for bringing this to our attention. Sometimes you need a good scientist to remind you that there’s only 24 hours in a day. More news from the Water-is-Wet and Sky-is-Blue department at 11! The only thing that’s really surprising is that it was only 2lbs. Then again, the study is only based on whether someone uses a car all the time, some of the time or none of the time. This study doesn’t equate not using a car to biking, which means that a large portion of these non-drivers are likely transit users, which requires a bit more exercise than driving, but it’s hardly the same as comparing drivers to bike commuters. It doesn’t surprise me that transit users come out ahead of drivers. Not only do they walk or bike to catch the bus/train, slight delays with tight connections often turn into a mad dash sprint. then again, since the transit agencies conspire to have crappy connections, you wait. So you go to Starbucks for a latte while you wait. I can time a bike ride to within minutes of any connection, Starbucks begone. We have to remember that Australians are less overweight than Americans to begin with. Their obesity rate is only 16% compared to ours of 34%. So in the US there probably would be greater difference in pounds between active and non active commuters. Health and economics: sedentary lifestyles and obesity mean higher risks for diabetes, heart disease, etc., and those things eventually end up costing the public money. So it goes for air pollution and bodily injury. This isn’t correlation. It’s causation. Let’s go over some facts. Driving burns only about 5 more calories than sitting, per hour. Biking burns about 100 calories/mile, depending on speed and condition. Driving is stressful and stress has been show, conclusively, to cause weight gain. Historically, stress often meant famine, so the natural reaction to stress is to store as much fat as possible. Biking/walking relieves stress, as does all exercise. So not only is one burning energy to perform the exercise, but also aren’t as affected by stress and its fat-creating hormones. Driving is, without any doubt, the absolute most lazy and sedentary form of transportation. Every single last other form of transportation burns more calories. Many alternatives burn a LOT more. It’s just simply not physically, as in physics (thermodynamics), possible for driving to not CAUSE more weight gain than other forms of transportation. Body weight is based on physics. Calories in minus calories out. Whatever is left over causes weight gain. There’s absolutely no way that someone, like me for instance, who burns over 1000 calories per day, a minimum of 5 days per week, by biking would not have less weight gain than someone who sits on their lazy rear in a car for those same trips. Whether you like it or not, it’s a causation that choosing the form of transportation with the absolute lowest calorie expenditure will result in more weight gain than choosing a form of transportation that has a higher calorie expenditure. Anecdotally I know this to be true. As soon as I moved from NYC for college and had to start commuting by car instead of walking + subway, I started to gain weight despite working out. 100 Cal/mile is an exaggeration. It’s more like 50 (varying a little based on your weight and how fast you’re going). But considering how much you would obviously love to bike to work, I feel for your frustration with the difficulties that you face. That’s called a theory, not proof or fact. Even if you’re right about the calories rate it doesn’t prove that people lose wait because they ride bikes. Another possibility is that people who are overweight don’t enjoy riding bikes as much so they choose to drive cars. The question is whether *choosing* to ride a bike will result in weight loss. Ignoring science doesn’t make it false. Your personal belief system doesn’t invalidate the fact that working out leads to weight loss. There’s plenty of controversy about whether working out leads to long term weight loss. Many people feel the equation is much more complicated than more calories burned => less weight. But even if it’s true you can’t assume that just because cyclists weigh less that the decision to bike leads to the loss. Likely it accounts for some but not all. This is not really controversial. The news is riddled with headlines that imply causation where only correlation has been shown. It’s easier to explain and grabs eyeballs. This is just one more example. I think you’ll find it nearly impossible to prove causation with pretty much any event relationship. If you look at correlation on a scale of “weak” to “strong” in terms of the likelihood of causation, I think that cycling (exercise) having an affect on energy output which in turn affects body fat/weight would show a fairly strong likelihood towards causation. I biked 17.5 miles each way to a friend’s place in the middle of December. Temps were in the high 30s/low 40s, and I encountered a 15+ mph headwind BOTH ways (the wind direction changed while I was there). I also came home long after the sun went down (I left his place at 1 AM to be precise). Despite a lot of factors working against me, I still made the trip in an hour, 20 minutes each way. This is at least 15 minutes faster than by public transit. Had it been a little warmer and not so windy, I might have made it in 1:05, give or take. Incidentally, I’m 50 years old, could stand to lose a few pounds, and not exactly Tour de France material. Lots of people bike over longer distances than most people typically associate with cycling trips. Even if you’re not game to ride 10 or 15 miles each way, just about anyone in any shape can ride 1 to 3 miles, which is typical for many car trips. It doesn’t take much reading of Streetsblog to find that the road to salvation is traveled on two wheels or in a transit vehicle. Unfortunately, the automobile has become the “default setting” for most Americans and using “alternative transport” requires getting out of most people’s “comfort zones” both literally and figuratively. what were you carrying on you for the ride? where did you change when you got there? if they live or work in super dense communities. It was a visit to socialize, so I wasn’t carrying anything, although I could have carried a substantial load if my bike was set up for it. And I didn’t need to shower or change when I got there, either. I dressed appropriately for the ride, so I was neither hot nor cold. It’s a myth that you always need to shower after a long bike trip. The first law of thermodynamics is as much a “theory” as gravity is. Biking burns considerably more calories than driving. Calories in minus calories out (with a fair bit of emphasis on what KIND of calories in) determines weight. Assuming the same diet, the cyclist WILL be thinner, period. Drivers aren’t getting fat magically. They’re getting fat because they eat more than they burn and their choices in transportation don’t burn any extra calories. Seriously? Making uneducated claims like this doesn’t make any points. Statements like “but i could not bring back enough items for myself, my wife and 2 kids” is absolutely a fallacy. Please do a bit of research first. Exactly how much stuff do you need each week? I’d rather have a meeting with an employee who just got done biking 20 miles, showing a willingness to exert effort and do work, than a fat one whose driving addiction shows nothing other than a desire to always take the ‘easy way out’. Nothing makes a worse impression in the business world than being fat. Plus, it’s not exactly rocket science to show up 10 minutes early, excuse oneself to the restroom to put on tie and jacket (or change shirts if it’s extremely hot), and wipe down with a ‘sport wipe’ (think giant baby wipe) and apply fresh deodorant. That’s still 50 more per mile than driving. It’s not physically possible to not be thinner by biking instead of driving, it would violate the laws of the universe. People can try to rationalize things all they want, but biking burns (extra) calories and driving doesn’t.